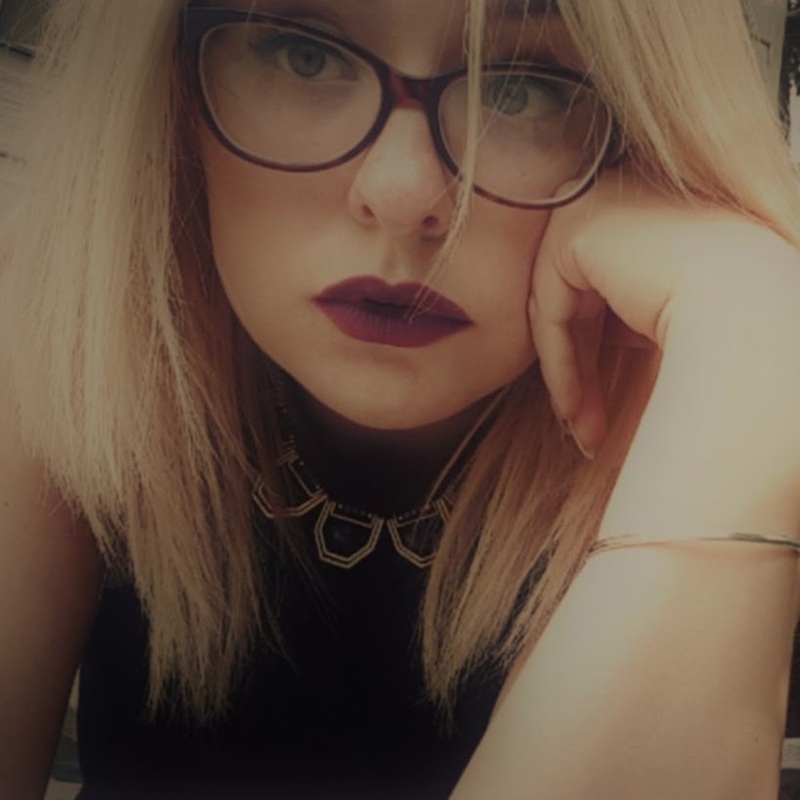 Did you know that 1 in 3 teenage girls worry about being followed by a stranger? 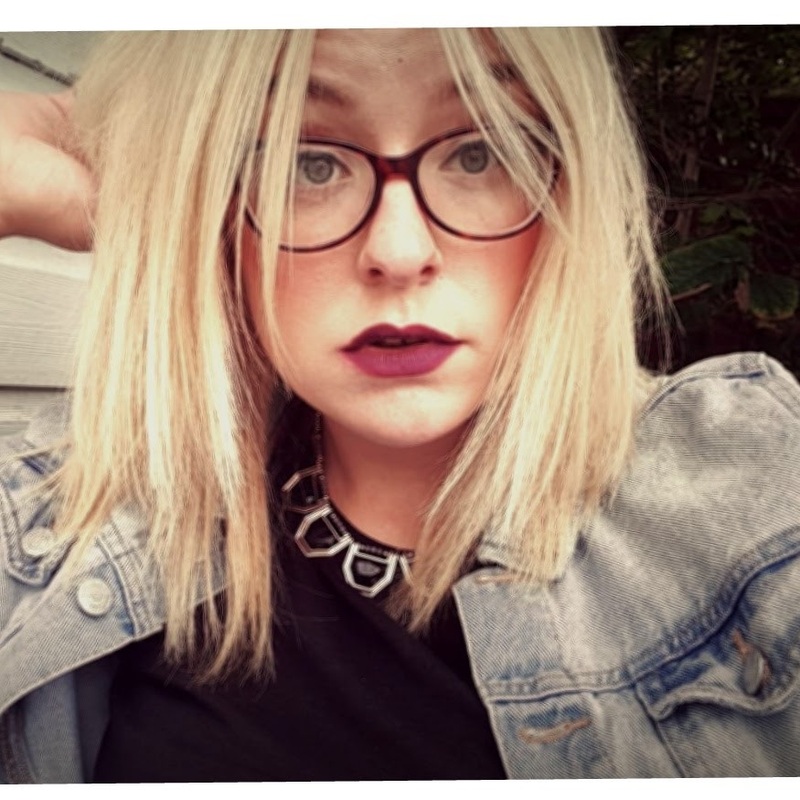 As a teenager, I was followed by a stranger, a middle aged man. I was probably 18/19 and had finished college early, popped into town and was walking home. I never usually worry about things like this and I probably had my headphones in and was in a little world of my own. I had walked out of town and wasn't anywhere near home, when I felt like I was being followed. I don't live in the same house any more but I had my usual route home but this time I decided to take a different route home. I looked over my shoulder and spotted a middle aged man following me. I decided that he may just be taking the same route but had made the decision to take the main roads home just in case. I walked down many roads and then needed to use the toilet! (TMI I know!!) This was the chance to see if the guy would follow me or would just walk past. After using the toilet and exiting, I resumed the walk home. There he was again behind me. My anxiety instantly went into overdrive. I tried calling my parents to meet me but no one answered the phone so I was stuck with a 20 minuet walk left on my own. Sticking to the main roads, I walked fast. The guy was still hot on my heels. I saw a person in the distance and I thought I might just see if they could help me but as they got nearer to me, I realised it was actually a friend of mine. We stopped to chat and I hinted that he was following me. She made a point in saying something about the police as he walked slowly past, eyeing us both us. He then hurried off and that was all I saw of him. 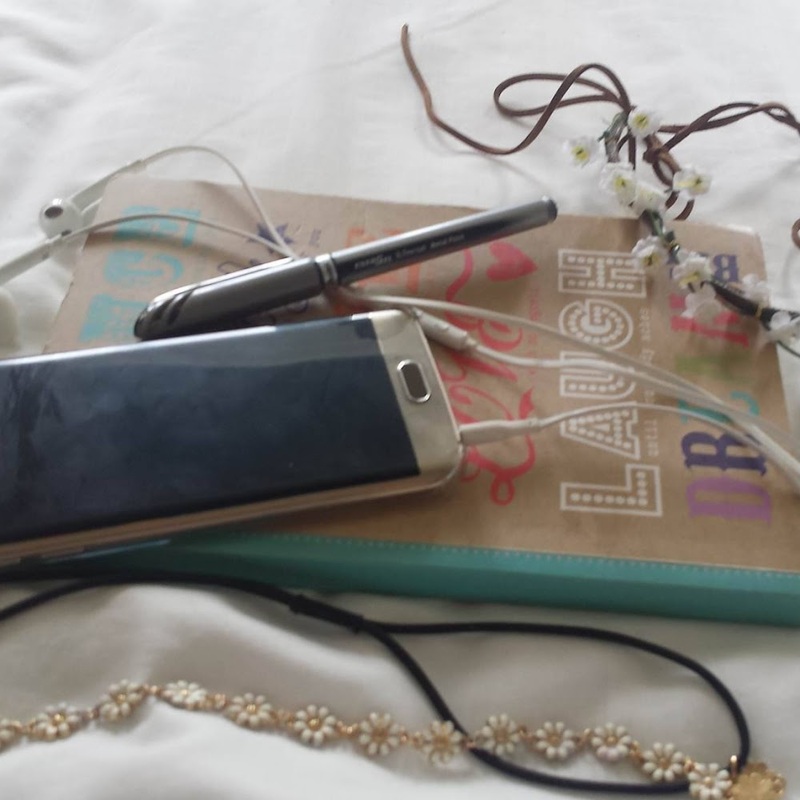 After chatting to my friend, I walked home and felt relieved that it was all over. That made me really think and made me think about safety and routes I walked. I would have usually have taken alleys, walked through parks or quieter roads, if I had of done this, who knows what would have happened. I know even now because of this, I am very cautious of people when I'm out and about. If I don't think I'm safe, I'll make a point to take myself out of the situation. I walk home on my lunch break four days a week and there's been times where there's been random strangers lurking on the street corner where I've crossed the road because they looked like they were up to no good. They may not have been, I don't know but I made that choice to not know. I think that this could be some of the reasons why girls and women feel vulnerable if they are alone. 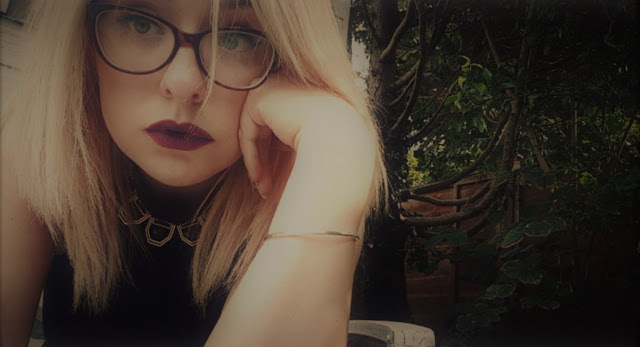 Young girls worry about being followed especially if they've been given the responsibility to go out on their own for the first time or haven't really gone out on their own before. This can all seem rather daunting. 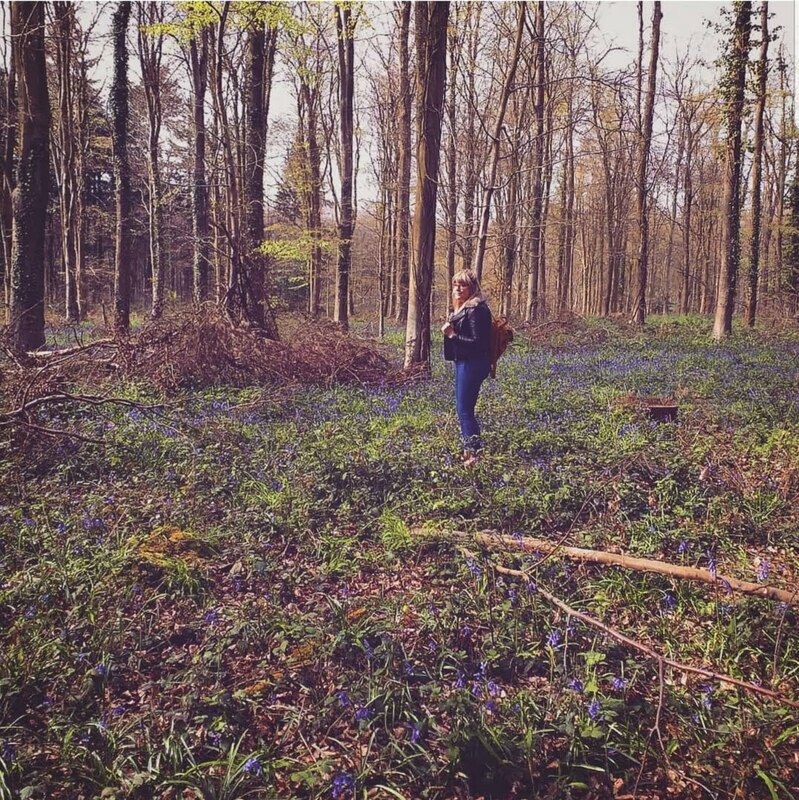 With things happening to women and girls in the world, it can be scary being on your own. Someones always got a story to tell about somethings that has happened and this can cause anxiety. If you ever feel like you're not safe, find a public building where there's lots of people in it. Make sure you have your phone or are near a phone to call someone. Keep calm. It's not just women or girls that feel unsafe, men or boys also feel unsafe and things happen to them too. It's important that you keep safe and let someone know where you are at all times. In the Good Childhood Report 2017, this was one of this was one of the things that The Children's Society found out. 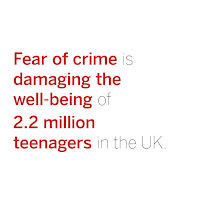 Not only that but the pressures of teenagers getting into crime. 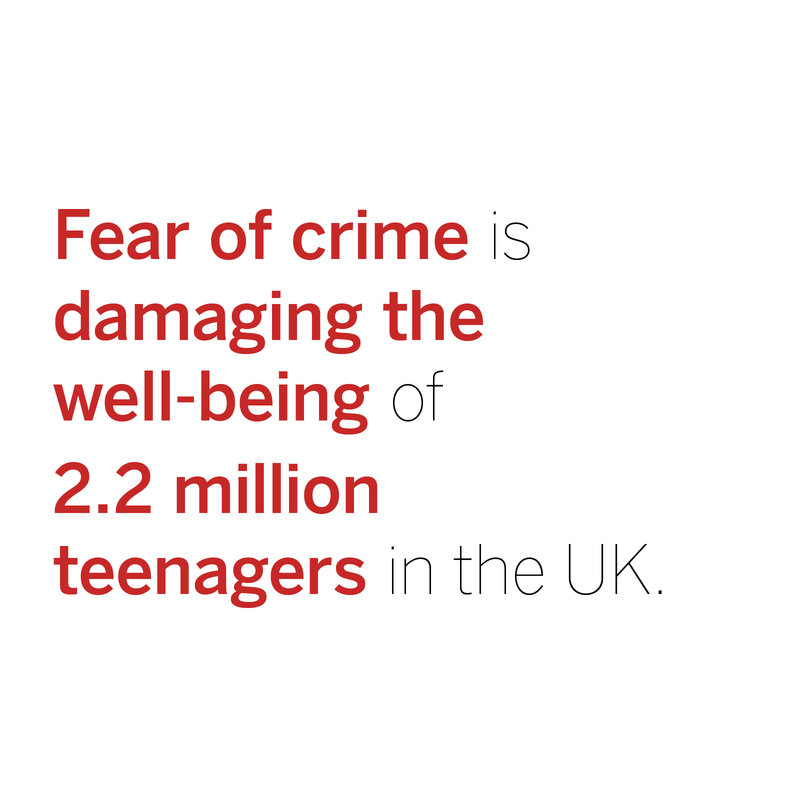 Did you know the fear of crime is a common problem, leaving 2.2 million teenagers unhappy? There is a lot of pressure in today's society on teenagers that can cause this. There may be pressures on having the latest things such as gadgets, clothes, make up etc that the only way they 'fit in' would be to steal. Not only that sometimes crime can be seen as 'cool' and sometimes teens can be peer pressured into it. Teens might be seen as a wimp or an outcast if they don't do what their friendship group wants and they may feel that they have no choice but to revert to a life of crime. 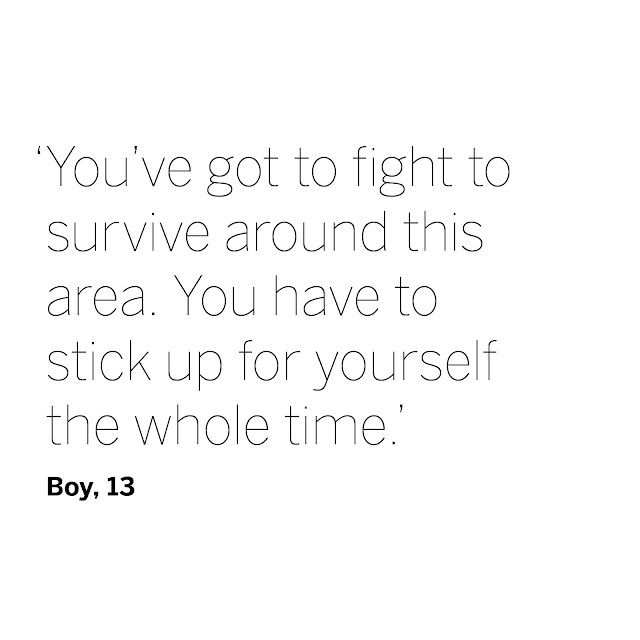 The Good Childhood Report 2017 also states that 1 in 4 boys worry that they'll be assaulted. I grew up in a council house area where there were lovely people and also some very not so lovely people and I know this only too well. A friend of mine got hurt when he decided to play out on the street. There was usually a group of lads that hanged around the area that lived in the same street or streets off of the one I lived in. They usually hanged out on the streets everyday after school and all day if it was the weekend. You'd usually get some kind of comment as you walked past and being a awkward as I was, I hated walking past them. My sister and I had made friends with dome siblings that lived next door but one from us and we started hanging out. On several occasions we had gone to the local park or walked to the shops to get sweets as kids do. There used to be this thug child that I was terrified of, that lived around the corner. On this particular day, they were on the corner and had water bombs. I decided that I was going to try not to be intimidated by them and walked past this boy, when he tripped me over on purpose and instructed his followers to throw the water bombs at us. I was soaked and really upset. I decided to go back home and walked back to my friends parents house and cried on his mum. I absolutely hated him. This didn't stop here, there were many times we got called names or got told we couldn't ride out bikes up and down the road. My friend got hit on several occasions and ended up with a bruise on his face. I don't know what happened to the kid but I only saw him a few times after that and then he vanished but when he went, I was relieved. Did you know that 200,000 children say they don't get enough emotional support at home? 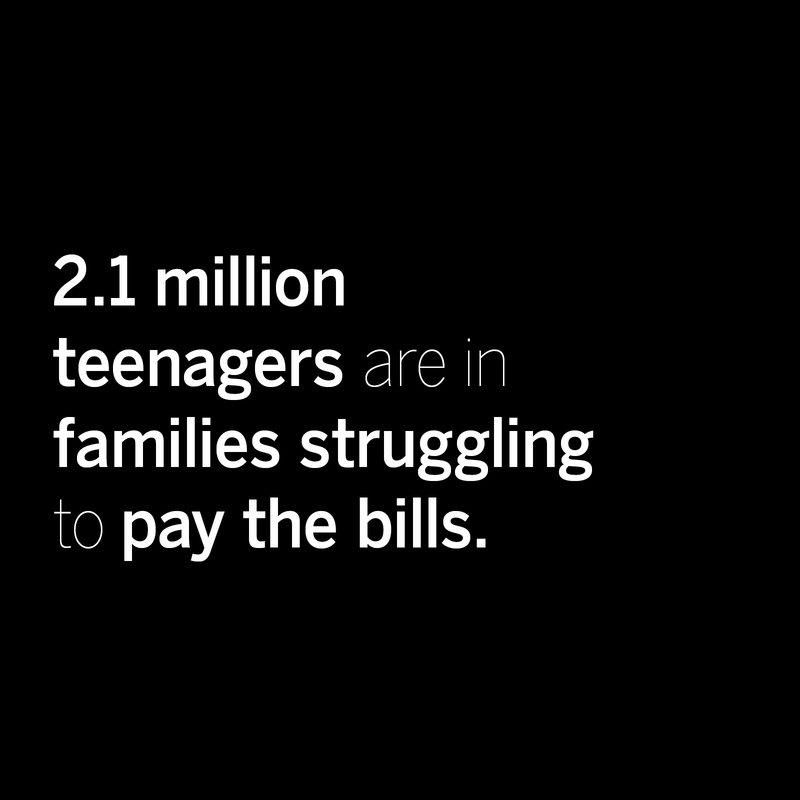 The government is cutting funding for local services that help children, teens and young adults when it comes to things like this. There's so many things that The Good Childhood Report 2017 has shown me. 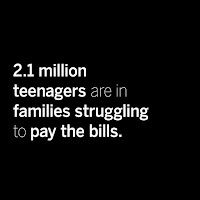 Did you know that 1 million teenagers have seven or more problems to deal with? These children are ten times more likely to be unhappy than those who have none. In today's society, children, teens and young adults have so much to deal with and so much pressure on them when it comes to exams, schooling etc. That cutting the funding could effect these children. The Children's Society have put together a petition asking the government for more funding to help these children. The happiness of young people is at it's lowest since 2010. Crime, living in a family that is struggling with money, not any support are just some of the issues that's leaving young children unhappy. If you'd like to help support the work The Children's Society is doing, I'll like the petition here. Let's help The Children's Society continue the good work they are doing and I'm privileged to be able to write for them again. This is something I fully support. 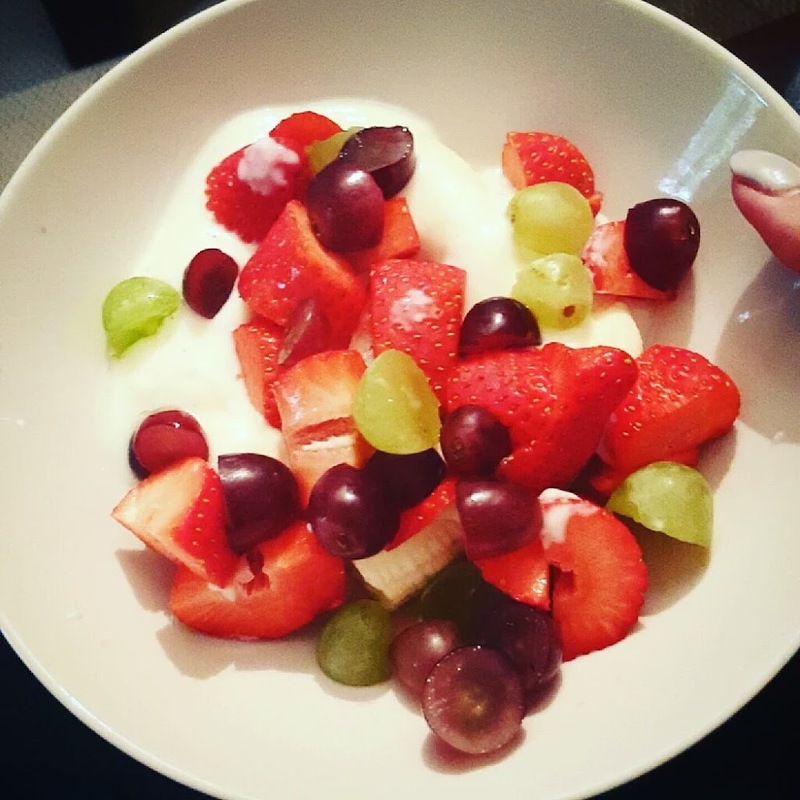 I'm the kinda girl who loves to treat her man! Whether it's simply buying a bar of chocolate (Galaxy if being correct because he's a chocaholic!) or simply a little something if I've run into town, I love the idea of surprising him with a little something when he gets home from work. I don't think its all down to men to surprise women with flowers and chocolates, even though it's nice when they do. 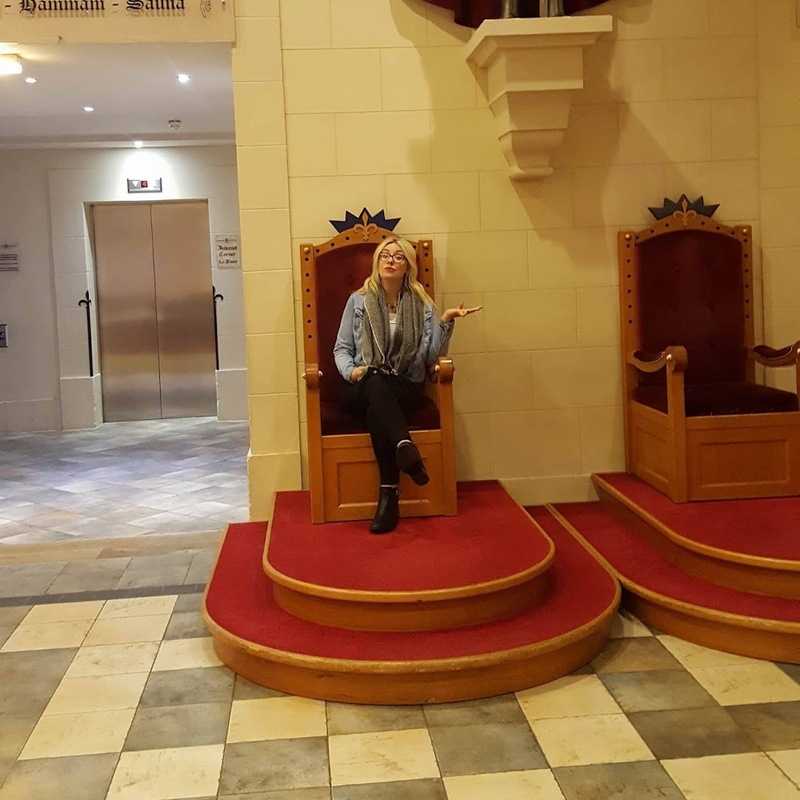 I'm a modern women and men deserve to be treated too! So when I heard about Men's Society I instantly thought this was something I'm interested in. Men's Society is a gift site for men. So for those males in your life, they could be in luck! I've had a sneak peak on their website and instantly there was just so much choice. Men's Society let me choice something to give to my fiancee as a gift and I knew this was going to be a struggle. There is just so much choice! If your looking for a gift for a male loved one then I urge you to take a look on their site which I'll link here! 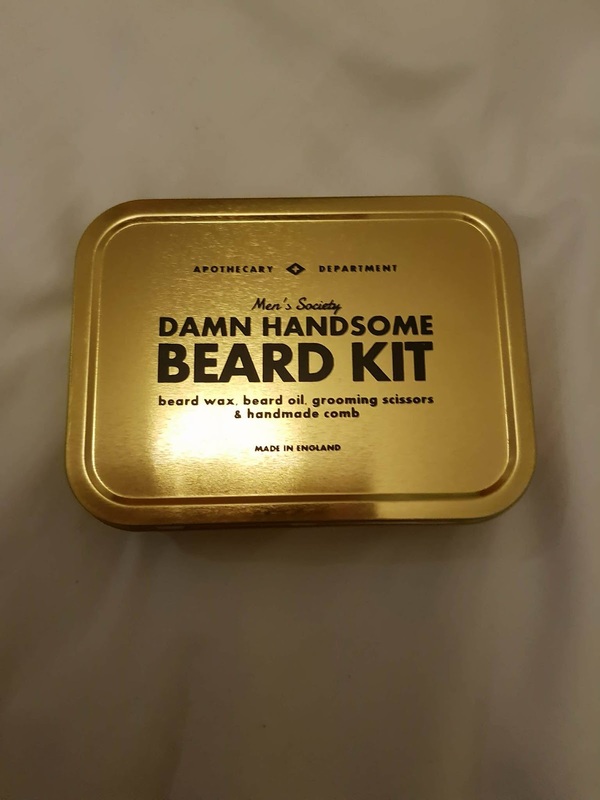 The gift I got sent was Damn Handsome Beard Kit. 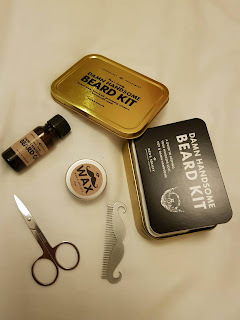 In this gift set came a little comb, scissors, beard oil and wax. 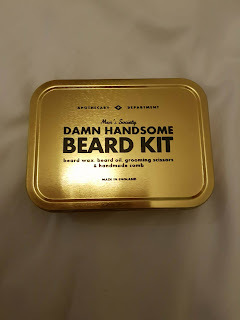 My fiancee had shaved off his beard just before this gift set came so we've been waiting for his beard to regrow in order to write this post! This kit is designed to keep beards looking trimmed, prevent any frizz and moisturise the skin as well as style the beard. This kit can be used on any skin types and can be used by all. This can be used at home or taken away. For best use, apply oil onto beard, massaging it through gently. Using the comb to brush through the beard and trimming the beard with scissors. Apply wax to style. We love this little kit and it's perfect for styling that beard! The oil smells really nice and not unpleasant which is brill. This oil is also cruelty free which is another bonus! The comb is so cute and the perfect size to comb through a beard. It doesn't tag at the hairs or hurt when combing. The scissors are the perfect size to trim and handy for those odd stray hairs. When it came to styling, we really liked how the wax came out the tub and smelt and felt nice when applied. As Christmas is fast approaching, would defiantly recommend taking a look on their site as they have some pretty good gifts. It's perfect for a male loved one. Here are some of the gift sets you can buy! I don't remember a lot of my childhood and have been told I've blocked most of my memories out. I guess there are several reasons behind this, ones that will be remained unanswered. From things I remember, I was always a child who would get into mischief. One memory I clearly remember was opening a washing machine full of washing in the launderette. We had just moved and we didn't have any appliances, so by the old house was a launderette where I'd help take the washing. On this particular day I had watched a lady fill a machine with all of her clothing, including a pink pair of pants which I clearly remember. She had left the launderette, leaving the machine to wash the clothing. As inquisitive as I was, I decided to press my face against the glass of the machine to watch these pink pants go around and around. Something in my head said open the door and so that is exactly what I did. The launderette filled into a paddling pool filled with bubbles and soapy wet washing. That pair of pink pants came floating by my feet. I was rushed out of that launderette so quickly, I don't even know if our own washing was completely done! I remember looking back at the launderette as I was dragged away and watching soapy bubbles pour out from underneath the door, leaving a bit of a puddle on the pavement in front of it. To the lady who's knickers I left in a soapy mess, I apologise and for those asking about the machine having child lock . . . it was the nineties! I became a big sister at eighteen months, I got given a little brother. The best present a little girl could ask for. Another person to try and get into mischief with or blame the mischief making on! I remember encouraging him to throw bedding down the stairs or toys that we weren't playing with all ended up in a heap at the bottom of the stairs! No one could get up and we couldn't get down.The more bedding that was pushed down the stairs, the more my little brother laughed! And I think that's the main reason why I did it. I have a strong bond with my brother and have always been very protective of him. (I'll be changing his name in this so I shall just call him Luke.) Luke was diagnosed with Autism, this was something I didn't understand as a child. He was just my brother Luke and he was my everything. I remember going to Sainsburys one morning with him in his major buggy when I came across a group of a lot older girls laughing and pointing at him. "Big Baby. That boys a big baby" They said loudly across the store as we were searching for vegetables. I remember turning around and feeling angry. I'd never felt angry as a child before and this was new. I stuck my tongue out at them thinking that it would shut them up but they still echoed the words "big baby" as we walked down the isle. That was the first time I swore to protect him and that I always would. And even to this day, I've kept my word. 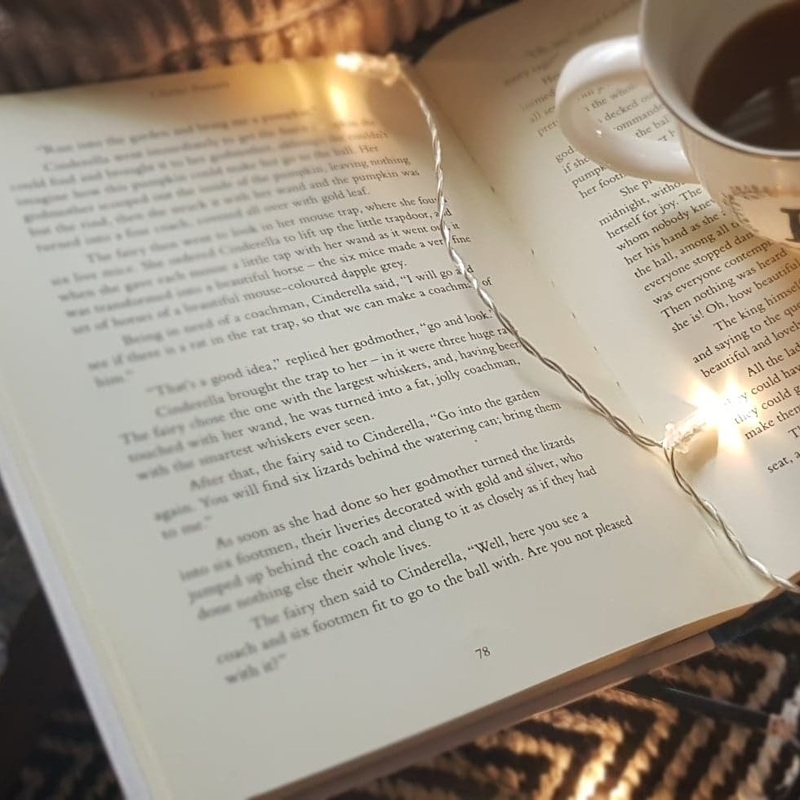 I write this like I'm writing a happy story about my childhood, that we always had great times filled with laughter and lots of happy memories. There were some good memories that I remember but most of the time there wasn't and these are the ones I remember the most. The moments I've recalled above are just a few memories I can actually remember. I am the eldest of nine for those who didn't know. We lived in a three bedroom house and it was squished, I'm not going to lie. I was forever known as the oldest of the nine or that child from that big family. I often got commented about for having a 'different' family. Our lives were a show, an image of what A and B wanted the world to see but behind closed doors it was completely different. The neighbourhood was fooled by a show of deception and lies. Those closest to us never saw a thing and if anyone came to the right conclusion of what was going on, they were gone out of our lives. Life was lonely and so we found we had each other. Just us nine against all the lies and deception. It's time for our story to be told. No more secrets, no more lies. This is Everything I Now Know.